A council has been criticised for acting unlawfully in its handling of the failed Mr Blobby theme park in Lancashire. 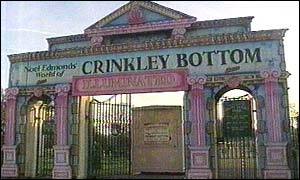 Crinkley Bottom in Morecambe, based around the fictional village made famous by former TV presenter Noel Edmonds, was opened in 1994. But the expected crowds failed to materialise and the city council lost £2m when it was forced to close 13 weeks later. A report into the fiasco concluded that the council acted "irrationally and unlawfully" when it changed its business contract with Mr Edmonds' company, Unique. But the district auditor, after a four-year investigation, has decided that the case will not be passed on to the High Court. Noel Edmonds condemned the report as a "fudge". He said: "We wanted these people investigated because they cheated the people of Morecambe out of something that could have been very significant. "Now, after all this time, this report is actually saying you can do something unlawful and basically get away with it. "I always thought Morecambe was famous for shrimps, it's now notorious for fudge." The city council had originally agreed to a 60/40 share of the park's income with Unique and a share of sponsorship. It then changed the agreement to offer Unique a fixed fee of around £1m over three years with the council keeping all gate receipts and sponsorship. But when the attraction was hit by poor attendance and sponsorship figures, the park was forced to close and Unique successfully sued the council for £950,000. The city council's final bill, including costs, came to about £2m. > The auditor said this had been "irrational and unlawful", adding that the council's decision to terminate its contract and launch its own legal action against the company was "mistaken". The auditor added: "No local authority acting reasonably and having regard to its... duty to local taxpayers could have taken such a decision." The report also cleared former council leader, Stan Henig and his deputy Councillor Ian Barker, of misconduct. The council's chief executive Mark Cullinan said: "Since 1994 significant steps have been taken to ensure such a situation cannot reoccur." A detailed response to the report will be issued following a full council meeting next month.